The Pennacook Native Indians of this northeastern state as well as the Cowasuck, Sokoki, Missisquoi and Arsigantegok lived on the land before any Europeans arrived. The Pennacook tribes located in the southern end of the region were one of the first tribes to encounter European colonists from Massachusetts. The tribe was decimated by the European diseases. The Pennacook fled north and west with other tribes, where they were hunted down and killed by English colonists. Those that survived, joined other scattered tribes people in the western New York area. There were various English and French explorers in the New Hampshire region between 1600 and 1605. The first permanent English settlement in the 1620s was at Odiorne Point. Then, a colonial defensive post on the island of New Castle was built by the English and named Fort William and Mary. Agnes Hilton, the daughter of William Hilton, was the first English child born in New Hampshire region in 1625. In 1641 the Massachusetts colony claimed the New Hampshire area, but the relationship between Massachusetts and the independent people of New Hampshire was troublesome and fragile. Over the next hundred years the status went back and forth between Massachusetts governing and New Hampshire with its own self-governing. Between 1741 and 1776, it was an English colony of its own. It became the first colony to declare its independence in January 1776. By June 1788, it became the ninth state to ratify the new U. S. Constitution and join the new nation. 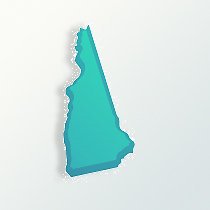 Looking at New Hampshire genealogy, being bordered with French Quebec in Canada, many French speaking citizens moved over the years into New Hampshire. They came especially to work the numerous textile mills that developed during the Industrial Revolution of the early 1800s. The state presently has one of the highest percentage of French-Canadians in the country. Those Irish leaving Ireland in the 1840s also settled in New Hampshire to become farmers and factory workers. The overall percentage of Irish in the state represents 22.5 percent. The northern end of the state has huge forest region for timber production. The state’s population in 1790 was about 141,800. In 1830 it had risen to 269,300 citizens and by 1880 it was 346,900. Looking at New Hampshire genealogy, additional immigrates arrived, some from Italy, France, Germany and Poland, all equaling about 40 percent of today’s population. In 2009, the state’s population sits at 1.3 million of which about 1.2 percent are African-Americans and 2 percent are Hispanic. Those of the Roman Catholic faith represent about 37 percent and those of the Protestant religions are 32 percent. The people of New Hampshire have gone from textile mills, shoe-making and small machining shops along with small producing farms. The agriculture is now producing dairy products, nursery stock, cattle, apples and eggs. Its industrial outputs are in machinery, electric equipment, rubber and plastic products along with tourism.